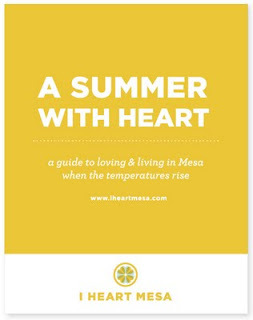 If you're local I really hope you're already reading I Heart Mesa. If not, well then you better jump your little buns on over there and subscribe. I've learned about some really awesome local places and activities thanks to that little blog. My kids owe most of our family outings to them! But now the IHM ladies have really outdone themselves. They created a summer guide that seriously filled my whole calendar for the next couple months. Who knew our little city had so much to offer?? Go check it out! while putting that guide together, i learned a bunch of things i didn't even know about too. glad you'll be enjoying it. Wow, thanks for the wonderful compliments! And thanks for sharing. This is such a ridiculous amount of work. Cool idea, I used to live in Phoenix a couple of years ago and this would have been nice to have, I definitely don't miss those hot hot summers though! This is amazing. Thanks for posting about it!